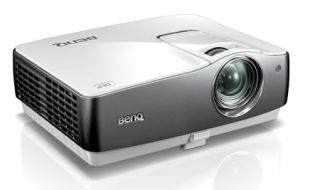 BenQ unveils W1200 Full HD projector for £1149 | What Hi-Fi? BenQ is expanding its range of home cinema projectors with this, the £1149 W1200 Full HD model. Using Texas Instruments' DLP technology, the W1200 incorporates Frame Interpolation technology to reduce motion blur and judder, adjustable colour management and 20W SRS WOW HD surround sound. Claimed contrast ratio is 5000:1, brightness is 1800 ANSI lumens and there's 10-bit video processing. A pair of built-in speakers make the W1200 a plug'n'play home cinema solution. When setting the projector up, owners can either make colour adjustments themselves or get the Imaging Science Foundation (ISF) to calibrate it professionally. The BenQ W1200 will be available in the UK from May 2011, along with the new £899 W1100.